In this article, I will review some economic history for the United States since the early 1990s. The objective is to argue that "secular stagnation" - which is generally viewed as a new thing which has popped up since the financial crisis for some reason or another - is really just an extension of existing trends that have been in place for at least 20 years. It's just that abnormal cyclical factors disguised underlying disappointing economic outcomes. The implications of this view is true are mixed. 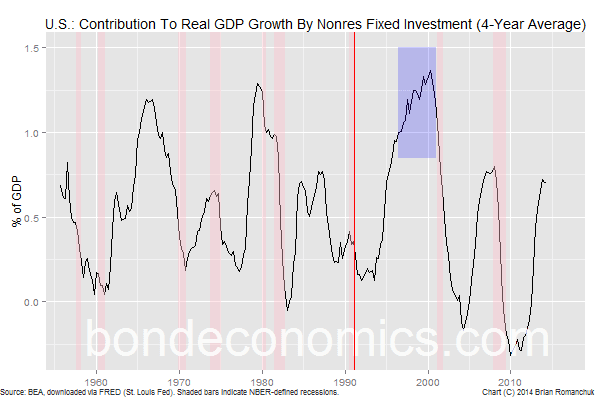 It is not impossible to revert to what is viewed as "normal" growth during an expansion, but we can expect that the economy will get stuck in the mud when recessions inevitably occur. This article provides some background to ,my analysis of secular stagnation using concepts from Stock-Flow Consistent (SFC) modelling developed in "Using Stock-Flow Norms To Explain Secular Stagnation" (link to Part 1, link to Part 2). My discussion here is descriptive, and I attempt to being bogged down with theory. My viewpoint here - that secular stagnation did not just suddenly appear after 2010 - helps solidify the analysis in those articles, as it is clear that a lot of trends in savings flows that I illustrated therein were in place for some time. Very simply, I see much less to explain about post-2010 economic performance than those who argued that economic performance from 1991-2007 ("The Great Moderation") was in some sense "optimal", and only recent performance is abnormal. The explanation of why growth is now lower is that growth was propped up by investment booms that were a mistake. Now that people have learned not to repeat those mistakes, growth rates are now at their true underlying trend. This argument is a paraphrase of Warren Mosler's description of this period, although he also lumps in the Savings & Loan crisis with the list of mistakes that boosted growth. I first ran into this viewpoint from my first boss when I started in finance in 1998, so this line of thinking has been around for awhile. From the standpoint of Minsky's analytical framework, the current environment can be viewed as the reverse of the normal process of private sector entities ramping up leverage from expansion-to-expansion. 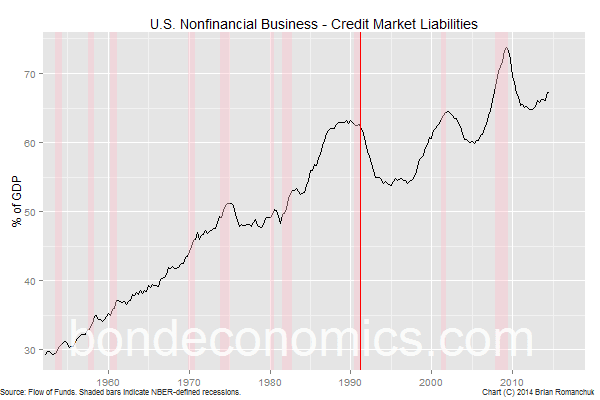 This is the result of caution picked up in response to mass default events, which is how behaviour changed after the 1930s. As in the previous articles, I will just look at the United States. Other developed countries had a similar pattern of development (except Japan), but special factors also had an important impact on the economic cycle over the past 20 years. For example, the euro area had a trend of convergence and divergence in economies. The United Kingdom flirted with an exchange rate regime, but was violently ejected from the ERM. These special factors somewhat cloud the discussion of the trends. The chart above shows nominal and real GDP growth. I have added a red line at the end of the 1990-1 recession (at March 1991) to make it clear which time interval I am interested in. 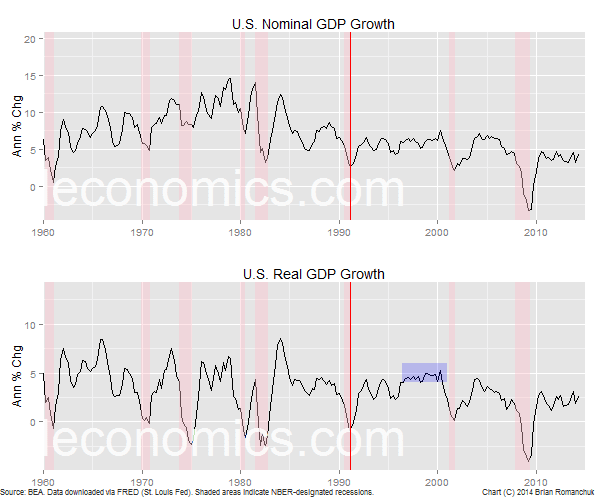 In the earlier periods, real GDP growth of 5% or greater was common (although recessions were more frequent). In the post-1991 period, annual real GDP growth was generally lower than 5%, other than the high growth spurt at the end of the decade that I highlighted in a blue box. My argument is that this period of stronger growth was an abnormality, and was non-sustainable. The growth during the 2001-2007 expansion was weaker, but it too relied on non-sustainable trends. What we are seeing in the post-2010 period is the true underlying trend for growth, now that the excesses of earlier periods have disappeared. 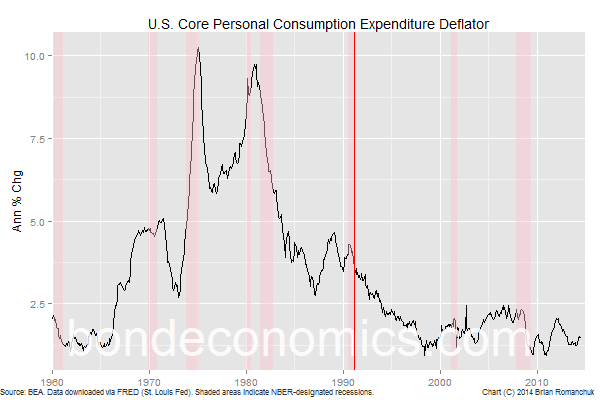 Since 1994, when the disinflation process was complete, annual core PCE inflation has been in the range 0.9% - 2.5%, which is remarkably stable when compared to its earlier history. The correct answer for inflation-watching has been to ignore it, and assume that it will be near 2%. Of course, if energy prices (and to a lesser extent food prices) are included, there is more cyclical volatility, Oil prices are set in a global market, and there is little that could be done about them with domestic policy settings in the United States. What the core inflation rate tells us is that the underlying trend in domestic-economy linked prices have been stable. The chart above illustrates why the 1991-2000 expansion broke away from a sluggish underlying trend - there was hefty fixed investment by the business sector that was steady for most of the latter part of the expansion. (The initial part of the expansion was mediocre.) 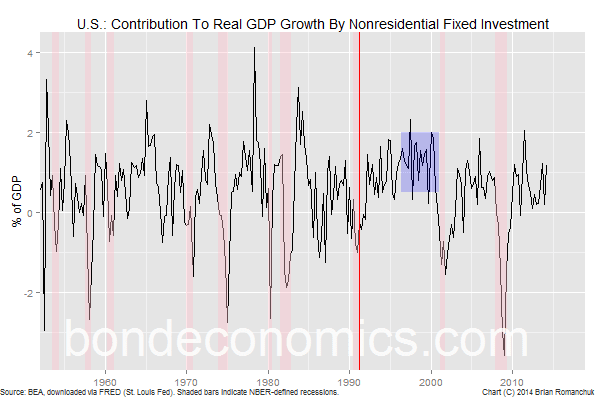 The series plotted is the amount nonresidential fixed (non-inventory) investment added to real GDP growth at any point in time. Earlier periods were more volatile and had higher peaks, but the steady nature of the contribution during the 1990s is marked. The chart above shows the average contribution to growth over a 4-year period. This average hit a maximum of 1.37% in April 2000, which was a post-war maximum. Although investment surges were larger during earlier eras, the 1990s investment boom stands out for the length of time it was sustained. The investment surge eventually overran the cash flow available to nonfinancial corporations, and they were forced to turn to the credit markets. Debt surged until the recession in 2001, at which point debt was often reduced the hard way - via default. The explanation of why this happened was largely the technology boom, but there was private sector exuberance throughout most sectors. Retail and restaurants boomed, etc. The housing market recovered from the regional weakness associated with the Savings & Loan crisis. However, this exuberance turned into a bust, as too much capacity was added, and some companies got ahead of themselves with borrowing (or even committed outright accounting fraud). 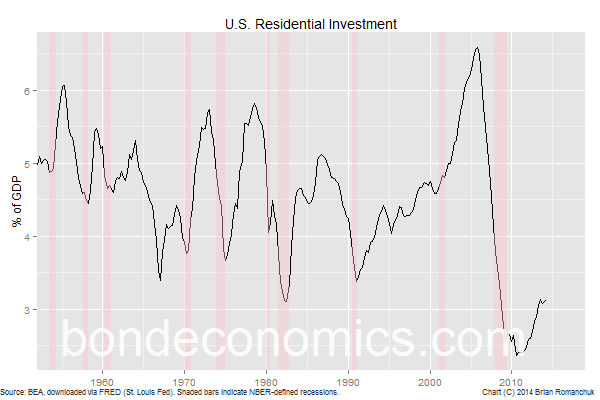 The boom in housing investment was the key driver of the last cycle, in the real (nonfinancial) sector at least. As is well known, there was a corresponding increase in mortgage debt that households were unable to service (chart in Part 2 of the previous articles). The business sector was more cautious, outside of construction and finance. However, residential construction is labour-intensive, and so that boosted the labour market. But once again, this boom was unsustainable and viewed as a mistake. It seems to me like there are additional methods of supporting your conclusion. When debt expands, especially private debt, the initial expenditure goes basically towards labor. Little physical change occurs unless human hand is involved somewhere, and human hand is evidenced by laboring activity even if the labor is utilized in producing primary materials..
Laboring activity is taxed in the United States with several taxes. We should be able to track these taxes to see if they did indeed increase during the time periods you examined. I looked in particular at the National Income Series W006RC1Q027SBEA which is Federal Government Current Tax Receipts. I would say that tax receipts dramatically increased during those investment booms. When we look at data series FRSI (Federal Government Receipts: Contributions for Social Insurance) we see a diminutive replication, diminutive to the point of near supportive indifference. I can not explain the small response except to offer that Social Security is based on the first wages earned, not on all wages. that shows a considerable GDP increase in Euro Land during the 2007 period. He speculates that this increase was U. S. Fed induced. I think you would focus the increase more on the U.S. residential boom which was funded by private debt backed with GSE guarantees (in my opinion). Thanks for the well considered post. Thanks. I'm in the middle of researching my next posts, so I will have to look at that article later. Current tax receipts should move with the cycle, as taxes are a fairly stable percentage of GDP (even though tax rates historically moved a lot), and the cycle is largely coincident with investment booms. I have not looked at social security, but as you point out, contributions are capped, so they are driven more by the number of people employed, and not income levels.